Today’s explosive demand for mobile broadband has led to one stunning deal Sunday. 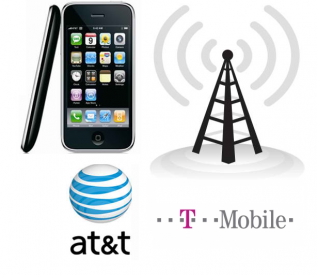 In a move described as a “fast, efficient and certain solution to impending spectrum exhaust challenges” facing the company, AT&T announced that it will acquire T-Mobile USA from Deutsche Telekom in a cash-and-stock transaction valued at approximately $39 billion. In return, Deutsche Telekom will acquire approximately 8 percent of AT&T and gain a seat on AT&T’s board of directors. The transaction, pending regulatory approval, will soon make AT&T the largest carrier in the U.S. It will also expand the company’s LTE 4G-based deployment to 95 percent of the US population, reaching an additional 46.5 million Americans, including those in rural communities and small towns. Currently, AT&T and T-Mobile USA have a combined total of over 125 million subscribers, while Verizon, AT&T’s closest rival, has over 93 million. In an op-ed piece on Mashable, Ben Parr says that the move is less about subscriber bases than about AT&T preparing for the 4G era of wireless communication. A wonderful marriage but no reception – hah. This is interesting though since they’re marketing themselves as separate entities in all T-Mobile commercials and advertising. It’s kind of scary though since T-Mobile has typically (for me) had great reception and now I’m going to have to switch. Thanks for posting LSB.